The smart alternative to bare-metal servers, with free DDoS-Defense™ included! Smart Servers have similar specifications and functionality when compared to traditional dedicated servers, but for a fraction of the cost. Why pay more for extra resources that you don’t need? Your resources are dedicated to you for your exclusive use, similar to a bare-metal server. Your CPU cores, memory, etc, are for your Smart Server, not someone else’s unit. All Smart Servers are provisioned behind our DDoS-Defense™ platform. We will protect from attacks up to 2Gbps, or more if you upgrade the protection. With a Smart Server, you get the ability to scale your resources on the fly. If you need more drive space or more RAM, it can be scaled up to meet those needs. Smart Servers allow you to have everything in one place. You have the server and its control panel with nothing beyond that to keep track of. It keeps it simple! Due to the marvels of new technology, we are able to install a Smart Management Layer on each bare-metal server and sub-divide it into smaller dedicated resource guests without compromising on quality. This gives the consumer the flexibility to decide whether they need to pay more for their own bare-metal dedicated server unit, or pay for only the resources they need and save money with a Smart Server. With capabilities of a dedicated server, a Smart Server will perform the tasks you need it for and then some. There is no need to worry about being affected by an overused resource on another server. Your resources are for you! 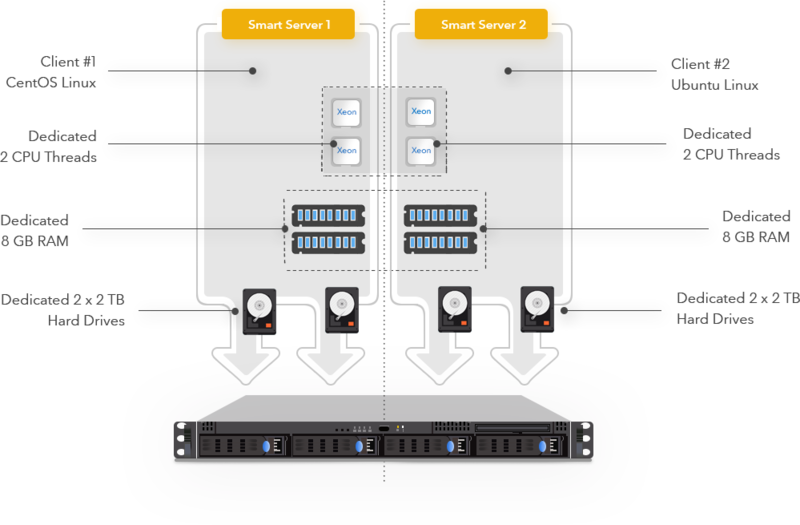 Since Smart Servers can be scaled up and down, it lowers the overall hardware and power costs and gives you only the resources that you require. Why pay for something that you aren’t using like an extra core that sits at 0% utilization all day? Smart Servers include powerful out-of-band control tools. You can open a console, force the unit to power on/off and reboot should the OS lock up. You can also see your bandwidth usage and monitor your server’s overall performance. Do you offer IP Pooling? Yes! For an additional fee per dedicated / smart server we can pool all of the IPs that you have with us in a single location (i.e. Chicago) so that you may utilize them across all of your servers with us at that location on your own VLAN. How many IPs do I get with my service, and can I get more? All of our smart servers come with 1 IP by default. If you wish to have more IPs, you can add them for an additional fee depending on block size. We offer blocks from /24 to /29. To order more IPs submit ticket to our sales team.